Chicken and dumplings is a dish which consists of a chicken cooked in water, with the resulting chicken broth being used to cook the dumplings by boiling. A dumpling in this context is a biscuit dough, which is a mixture of flour, shortening, and liquid (water, milk, buttermilk, or chicken stock). The dumplings are either rolled out flat, dropped or formed into a ball. It is a popular comfort food dish, commonly found in the Southern and Midwestern United States, that is also attributed to being a French Canadian meal that originated during the Great Depression. Chicken and dumplings as a dish is prepared with a combination of boiled chicken meat, broth produced by boiling the chicken, multiple dumplings, and salt and pepper for seasoning. In some areas, this meal is known as chicken and sliders. The name of the dish is sometimes printed on menus as "chicken n dumplings", "chicken 'n' dumplings", or "chicken-n-dumplings". "Dumplings" is sometimes spelled "dumplins" in this context. Various commercial preparations of chicken and dumplings are available, including canned and frozen versions of the prepared dish. Frozen raw dumplings, typically very flat strips about 1x4 inches, can be cooked in any broth. The consistency of the prepared dish, whether homemade or purchased, varies from a thin soup to a very thick casserole-like consistency, easily eaten with a fork. Thicker preparations are made by boiling the dumplings longer and/or adding flour or another thickening agent directly to the broth. Flour tortillas or canned biscuits, rolled thin on a floured surface, cut into strips, are a quick and easy substitute for homemade dough. Butter may be added to the recipe for added richness. Since chicken meat would become dry and tough if it is boiled long enough to cook the dumplings and thicken the broth, the chicken or parts are removed from the broth before adding the dumplings. While the dumplings are cooking, the meat is separated from the bones. When the dumplings are done and the broth seasoned and thickened, the chicken is returned to the broth. The dish is then ready to be served, but may be kept on low heat so as to not further cook the chicken. Although the dumpling has been around for many generations, each culture has its own way of individualizing the basic dumpling recipe. There are other international versions of chicken and dumplings. For instance, the Chinese culture has the wonton, which is similar to the chicken and dumplings dish as we know it today. Additionally, the Iranian-Jewish dish, called gondi, includes matzah ball dumplings, which are also common in Central European food. Since the creation of the dumpling, various meats aside from chicken have accompanied it, such as beef, lamb and pork. 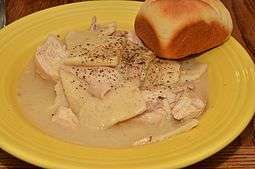 Wikimedia Commons has media related to Chicken and dumplings. 1 2 Fowler, D. (2009). Classical Southern Cooking. Gibbs Smith. p. 300. ISBN 978-1-4236-1351-0. Retrieved November 5, 2016. 1 2 3 4 Gannon, B.; Smith, L.; Namkoong, J. (2011). Family-Style Meals at the Hali'imaile General Store. Potter/TenSpeed/Harmony. p. 142. ISBN 978-1-60774-142-8. Retrieved November 5, 2016. ↑ Skaggs, S. (2016). Real Food Slow Cooker Suppers: Easy, Family-Friendly Recipes from Scratch. Page Street Publishing. p. 116. ISBN 978-1-62414-280-2. Retrieved November 5, 2016. ↑ McDermott, N.; Beisch, L. (2015). Southern Soups & Stews: More Than 75 Recipes from Burgoo and Gumbo to EtouffÃ©e and Fricassee. Chronicle Books LLC. pp. 106–107. ISBN 978-1-4521-3230-3. Retrieved November 5, 2016. ↑ Engineers, N.B.C. (2005). Preservation of Meat and Poultry Products. Asia Pacific Business Press, Incorporated. p. 220. ISBN 978-81-7833-030-3. Retrieved November 5, 2016. ↑ Florence, Tyler. "Chicken and Dumplings". Food Network. Retrieved 14 November 2014. ↑ Gordon, Steve. "Chicken Pastry Recipe". Taste of Southern. Retrieved 16 November 2013.